Description: 32 count vintage linen with Anchor floss. 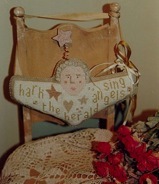 Stitches include French knots and eyelets. Description: 32 count Natural linen with Anchor floss. Stitches include Stitches include satin and smyrna. Description: 35 count Glenshee linen with Anchor floss and Sampler Threads from The Gentle Art. Stitches include smyrna, rice, satin and over one. Description: 32 count Natural Glenshee linen with Anchor floss and Weeks Dye Works. Stitches include eyelets, rhodes and satin. Includes brass bee. Description: 36 count hand-dyed linen with Anchor floss and Sampler Threads from The Gentle Art. Stitches include smyrna. Description: 32 count hand-dyed linen from Birds of a Feather with Anchor floss and silk ribbon from The Thread Gatherer. Stitches include satin, eyelets, spiderweb rosettes and over one. Description: 32 count Tobacco linen from Lakeside Linens with Anchor floss. Includes 4 buttons. Description: 35 count Vatican Red hand-dyed linen from R & R Reproductions with Anchor floss. Includes 6 red buttons. Description: 35 count natural linen with Anchor floss. Stitches include satin and Kam's coils. Description: 28 count Barnwood linen with Anchor floss and Weeks Dye Works. Stitches include rice, satin, smyrna and eyelets. Description: 32 count linen with Anchor floss. Stitches include rhodes, smyrna, satin, eyelets, over one and spiderweb rosettes. Description: 35 count 18th Century Stone hand-dyed linen from R & R Reproductions with Anchor floss. Stitches include satin. Description: 32 count Plum linen from Lakeside Linens with Anchor floss. Stitches include satin. Description: 32 count Natural Glenshee linen with Anchor floss. Stitches include eyelets, smyrna, satin and rhodes. Includes number chart for year. Description: 32 count Willow Green Belfast linen by Zweigart from Norden Crafts with Anchor floss and Mill Hill beads. Stitches include satin. Description: 32 count Clay Belfast linen by Zweigart from Norden Crafts with Anchor floss and a Just Another Button Company button. Description: 32 count Thistle Pink linen from Lakeside Linens with Sampler Threads from The Gentle Art, Weeks Dye Works and Anchor floss and Mill Hill beads. Stitches include smyrna. Description: 32 count Dirty Belfast linen by Zweigart from Norden Crafts with Weeks Dye Works and Sampler Threads from The Gentle Art. Frame by East Side Mouldings. Description: 30 count Natural linen with Anchor floss and twine! Stitches include double leviathan, eyelets and French knots. Description: 40 count Sandstone linen with Anchor floss. Stitches include smyrna and French knots. Description: 35 count Dirty linen with Sampler Threads from The Gentle Art. Description: 32 count Sandstone linen with Anchor floss and Weeks Dye Works. Stitches include satin and smyrna. 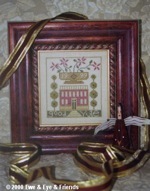 Description: Includes sampler and scissor weight designs. 32 count Vintage linen with Anchor floss and Weeks Dye Works. Stitches include eyelets, smyrna, satin and over one. Description: 32 count Savannah Rose linen with Anchor floss. Stitches include rhodes, Scotch and satin. Description: 32 count Glenshee linen with Anchor floss. Stitches include satin, rhodes and eyelets. Correction: There are some charts with an incorrect symbol. If your chart has a check mark for Anchor 842, it should be an X symbol. Description: 29 count hand-dyed Muffin Glenshee linen with Anchor floss. Stitches include eyelets, smyrna, rhodes, satin and spiderweb rosette. 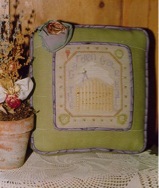 Description: 32 count Crème linen with Anchor floss. Includes directions for finishing into a pinkeeper and button form. Description: 32 count Mocha Belfast linen by Zweigart from Norden Crafts with Anchor floss. Includes 4 buttons. Description: 40 count Dirty linen with Anchor floss. Stitches include eyelets and French knots. Description: 40 count Sandstone linen with Anchor floss. Stitches include satin, smyrna, spiderweb rosettes and over one. Description: 32 count Vintage Heather linen from Lakeside Linens with Anchor floss. Stitches include eyelets, rhodes and satin. Description: 27 count Dirty linen with Anchor floss and Sampler Threads from The Gentle Art. Stitches include double leviathan and smyrna. Wool is used for the hag hair. Description: 40 count Sandstone linen with Anchor floss and Sampler Threads from The Gentle Art. Stitches include smyrna. Includes star button. Description: 32 count Vintage linen with Anchor floss. Stitches include rice, four-sided, double leviathan, satin and over one.